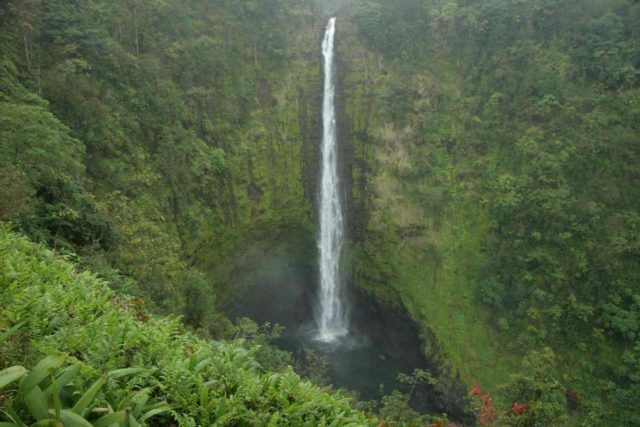 Even though this is a waterfalls website, we recognize that there are many highlights in the state of Hawaii (both involving and not involving waterfalls). So we’ve come up with this page to pay homage to some of the highlights that we think are worth mentioning as you try to figure out what to see and do in your own trip plans. 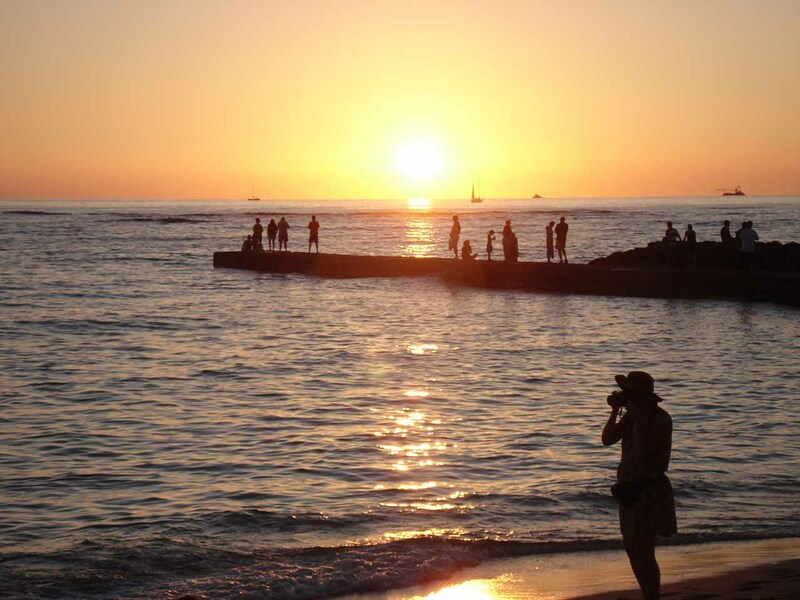 While I recognize that this list is by no means exhaustive and that it is highly subjective, at least you have an idea of what we loved about the Hawaiian Islands. Many people swear if there’s one time it’s worth getting up at 3am in the morning to see a sunrise, this is it! Watching the sunrise atop Maui’s dormant volcano not only lets you see the sun rise above the clouds, but it also let us get a head start to the day, whether it’s driving the Road to Hana, doing the Sliding Sands Trail, or riding a bike down the road afterwards. One of the more unique experiences on Maui is to hike amongst the volcanic badlands and craters atop Haleakala. The Sliding Sands Trail goes right into the heart of the cratered moonscape. You can go as far as you’d like to go, but the views are quite good no matter where you are on the trail. 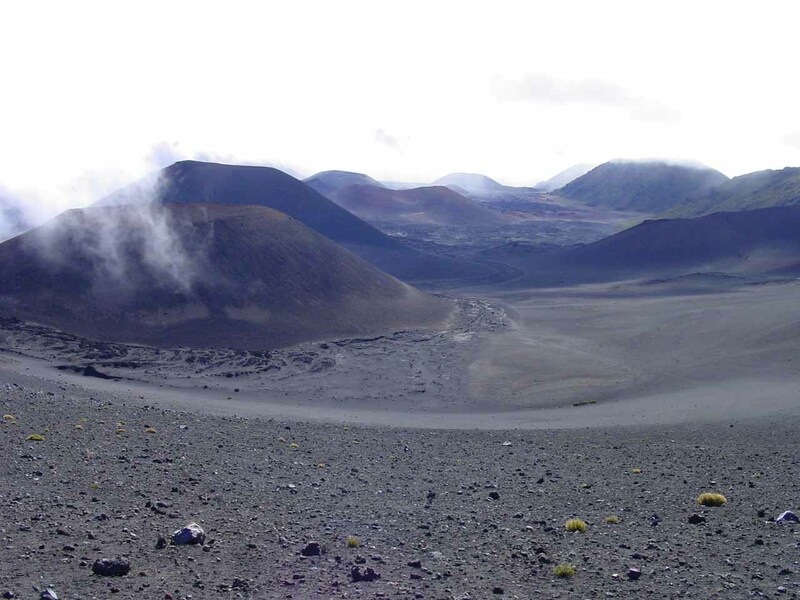 We went as far as the Ka Lu’u o ka ‘Ö’ö vent, which was the nearest crater, and that was about five miles round trip, which is harder going back up to the trailhead than going down into the Haleakala Crater itself. In this highlight, I’m advocating to do the entire drive around the east side of Maui (pretty much going completely around the base of Haleakala). 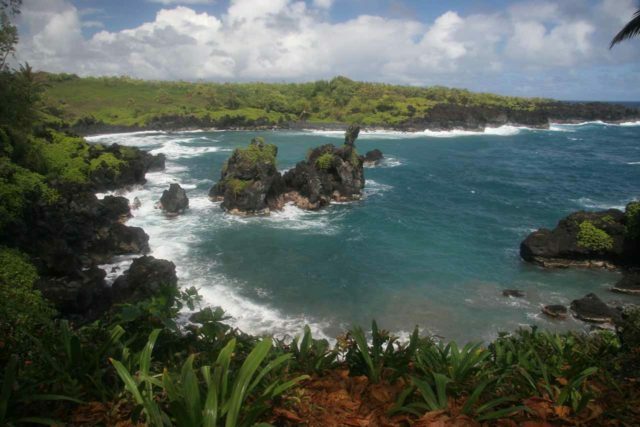 This full day (get an early start) begins with the famous drive along the Road to Hana, which is chock full of waterfalls in the very lush windward side of the island. 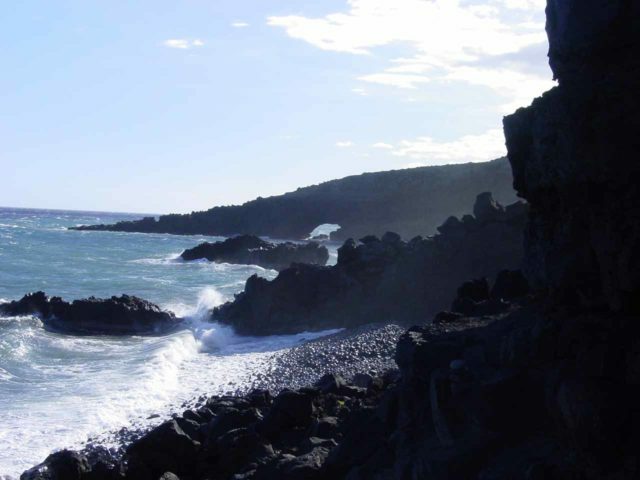 Then, after getting past the Kipahulu District of Haleakala National Park, the road starts to become unpaved and follow a windier and drier side of the island full of old lava flows as well as the impressive Pokowai Sea Arch. 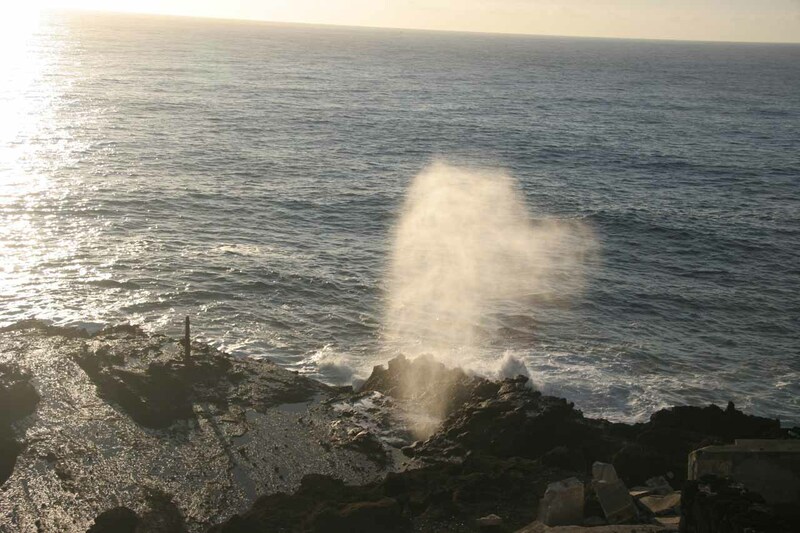 The Nakalele Blowhole is an interesting attraction in the less populated part of West Maui. 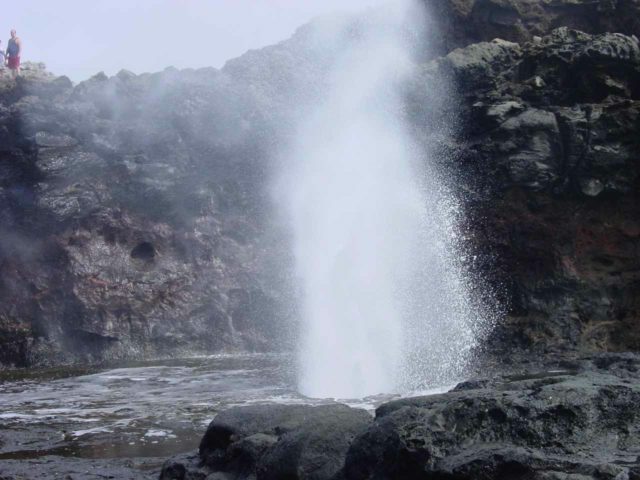 It can spout water up to 100ft and consistently puts on a show when the ocean swells are high. It’s also worth checking out the funky rock formations on the way to the blowhole as well as a smaller blowhole that also performs at high tide. 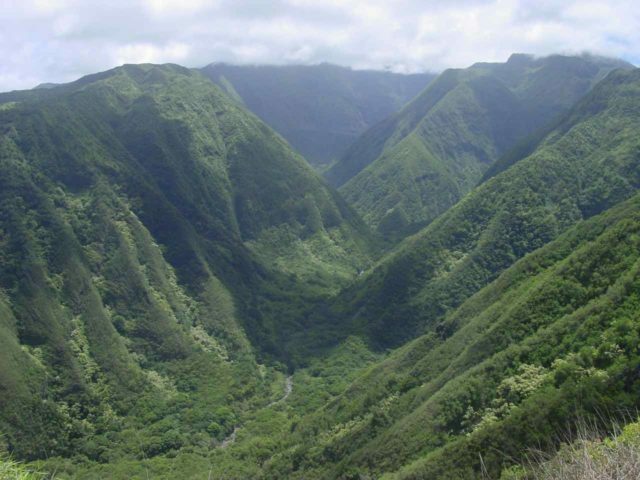 This is an impressive valley situated on the northeast side of West Maui. 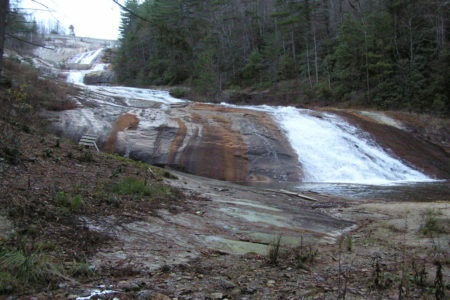 We were able to experience its rugged beauty in a couple of different ways. First, we did the Waihe’e Ridge Trail which overlooked the valley as it made its way up to a vista amongst the lesser-seen wilder West Maui Mountains. We also managed to hike inside the valley along the Waihe’e Valley Trail (also called Swinging Bridges), which went by old ditches and tunnels as well as traversed a pair of the namesake swinging bridges. 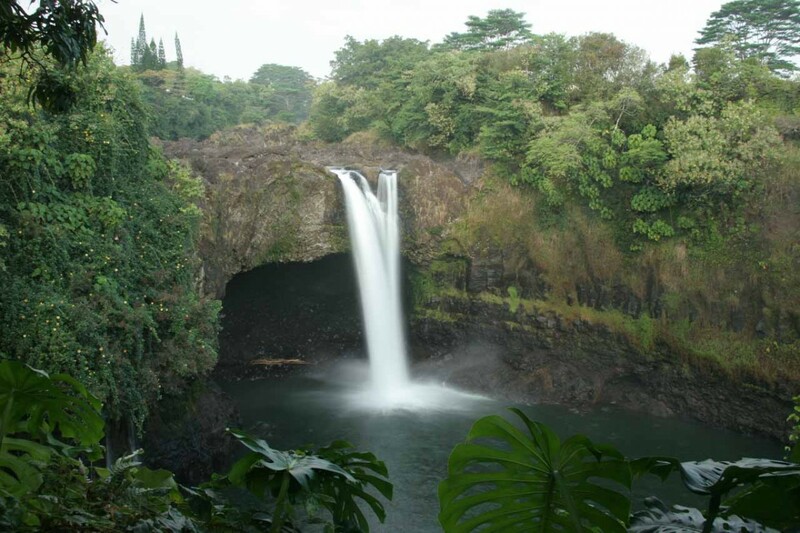 We eventually made it out to the Ali’ele Falls, which was our turnaround point. In order to experience the inaccessible parts of the island, we had to take to the air. But in order to truly get an unforgettable experience, we opted to take a tour with the doors off! 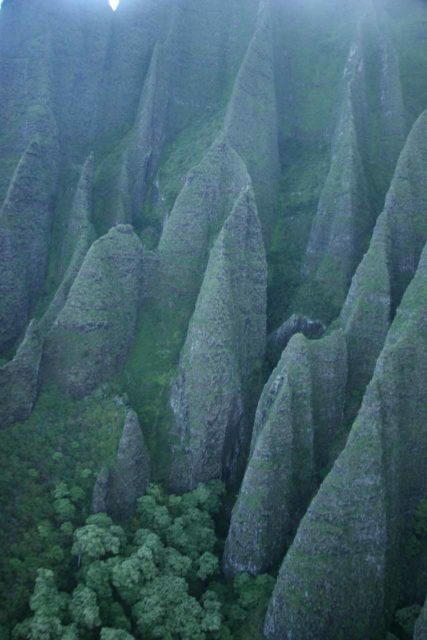 Indeed, while flying over Kaua’i can be the highlight of a trip here, I found that having the doors off not only improved the photos (no window glare out of the side doors), but it induced less air sickness for me. In our experiences, the chopper tour went over Waimea Canyon, Kalalau Valley, Na Pali Coast, Hanalei River Valley, Wai’ale’ale Crater, Alaka’i Swamp, and the Manawaiopuna Falls among other things. Known as the Grand Canyon of the Pacific, it features many characteristics of its counterpart in Arizona such as striated layers exposing the geological history of the island as well as deep canyons and tall temples at the apex. Given the wet nature of Mt Wai’ale’ale and the saturation of the Alaka’i Swamp, it’s no wonder that the waters have carved such a canyon on a time scale that is much shorter than the relentless carving by the Colorado River in the original Grand Canyon itself. 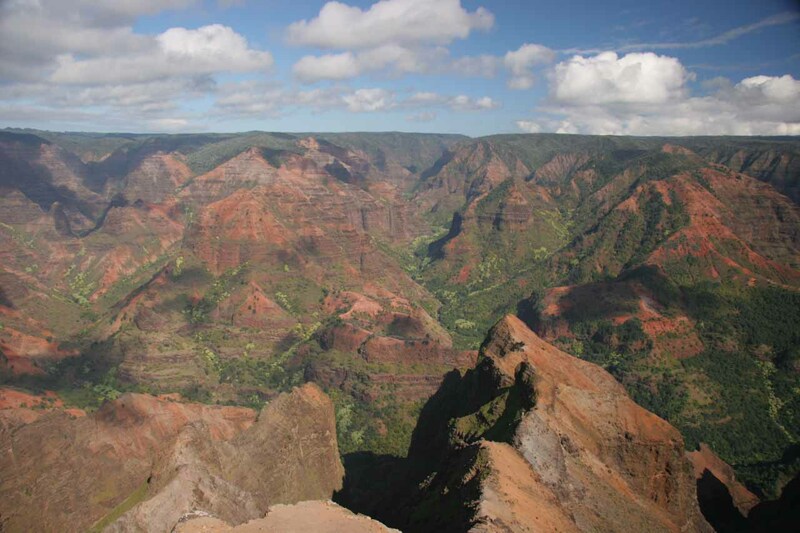 Going up to the end of the road (further beyond the lookouts for Waimea Canyon), we managed to look into the secluded Kalalau Valley from both the Kalalau Lookout as well as the Pu’u o Kila Lookout. Peering into the Kalalau Valley from this lofty vantage point was the easiest way to experience this part of the Na Pali Coast without doing the much more strenuous Kalalau Trail. 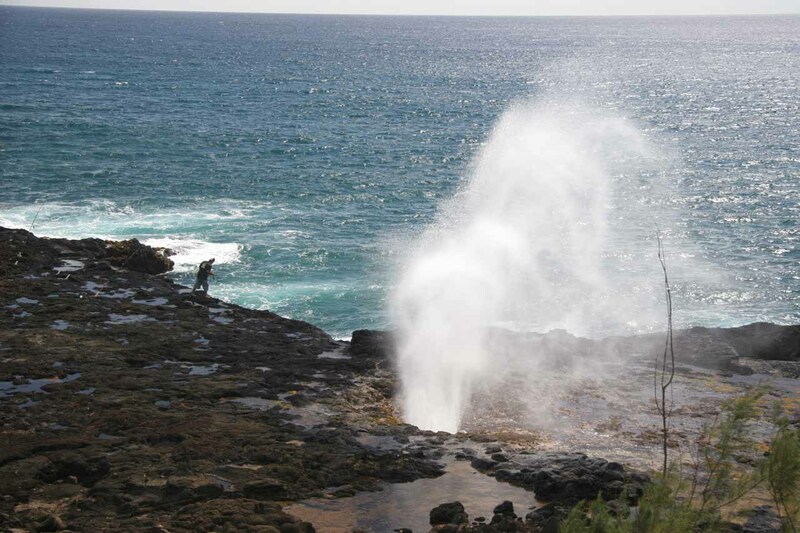 This popular blowhole near the resort area of Poipu (or Po’ipu) can shoot sea water nearly 100ft. Since we happened to make our visit during the Winter, I think that was a big factor in terms of high ocean swells, which tended to yield the best (and noisiest) shows put on by the hissing blowhole. There’s lots of drama in its display as the horn usually shoots up an initial jet of water before giving one spout of water in its last gasp. Then, it begins again as the next incoming swell gets pressurized and shoots out of its release valve, so to speak. This world famous beach is actually a series of beaches. 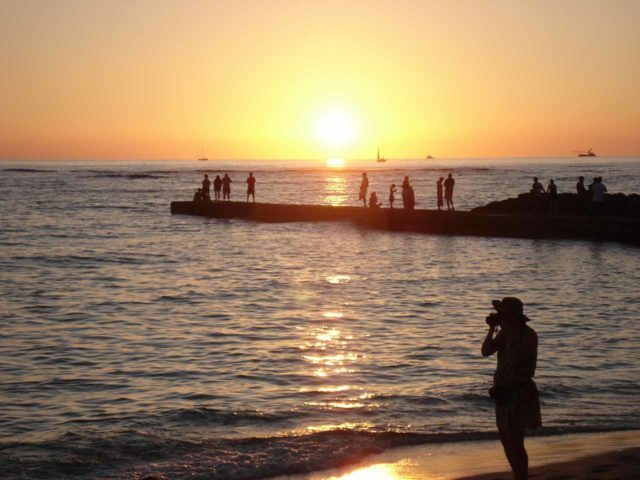 Featured here are of course the long sandy beaches fronted by a relatively calm ocean and backed by high rise resorts and ocean-view restaurants. Just about everyone who visits Oahu will spend some of their time at this beach as it’s really what you get when you mix urban development with a beach in a scene that reminds me more of the LA beaches than a Hawaiian one. Thus, there is such a plethora of activity here, and it’s amazing to see so many people from so many different places congregating for pleasure. Indeed, it’s hard to ignore the energy of this place. Julie and I have also found this beach to be great for seeing sunsets. On the rugged windward side of eastern O’ahu, we chanced upon this impressive blowhole as well as the nearby beach, which was on the other side of the Diamond Head. 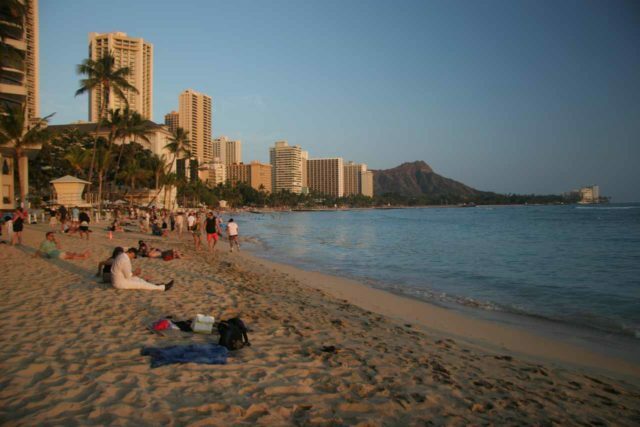 Anywhere west of there was busy as that was the famous Waikiki Beach. So it was refreshing to actually experience this other side of the island, especially watching the blowhole putting on a show against the morning sun when the swells are high. A large car park with viewing deck allowed us to get a good look at the blowhole from a distance. There is a short path leading closer to the blowhole, but the authorities closed it off due to safety and liability concerns. This public park gives you relief from waterfall fatigue as you drive the Highway to Hana. 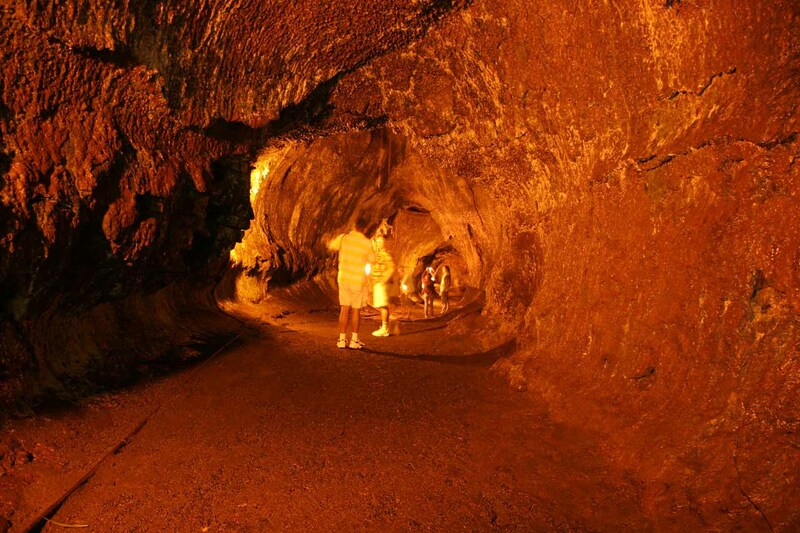 Located just minutes from Hana Town itself, you’ll find a gorgeous black sand beach, lava caves, lava tubes, blowholes, rock formations, coastline views, and lava arches. 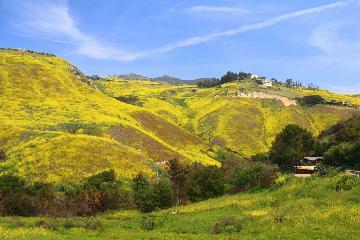 It’s easy to lose track of time here and spend hours wandering around here checking out the park’s natural wonders. Once at the very popular park, there are easy trails going along the coastline allowing you access to the above-mentioned attractions. 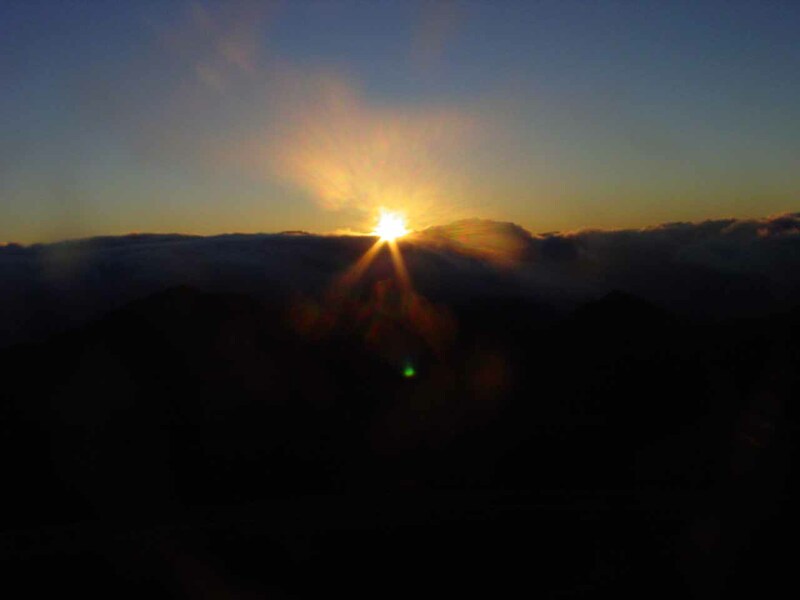 The presence of the volcanic features testifies to the volcanic history of Haleakala volcano and offers a glimpse into some of the geologic processes that have shaped the Hawaiian Islands. This was the one place in the Hawaiian Islands where we got to witness the effects of fresh land creation. Indeed, this reserve showcased recent lava flows along the Chain of Craters Road, the huge Thurston Lava Tube Cave, the Holei Sea Arch, and overlooks of the Kilauea Crater. I broke this out into its own highlight, but it was quite an adventure on its own for us. 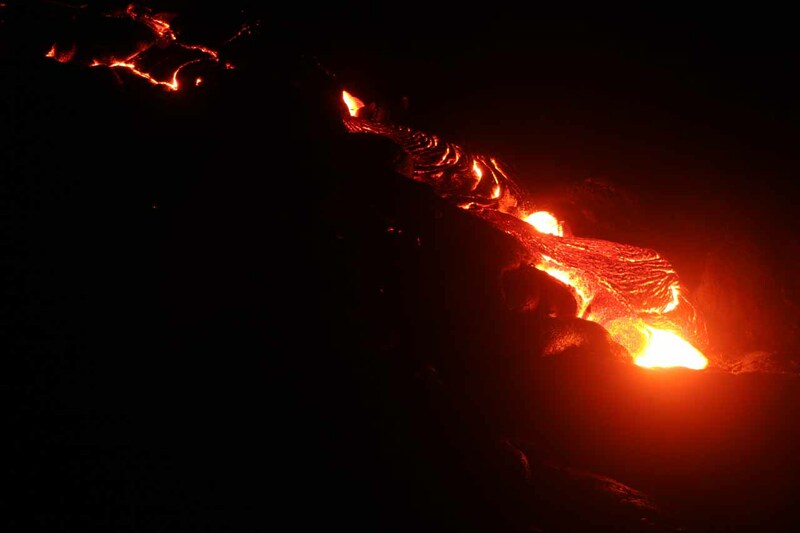 While the locations of active lava flows are totally up to the whim of Madame Pele, we had to earn our sighting with a bit of a long hike over dried up lava in the dark! We wound up going nearly 7 miles round trip, but when we finally witnessed the spectacle up close, it was easily the most surreal experience we had ever done in all the Hawaiian Islands. And if I had to pick which of the things listed on this page was the top highlight, it could very well be this one! 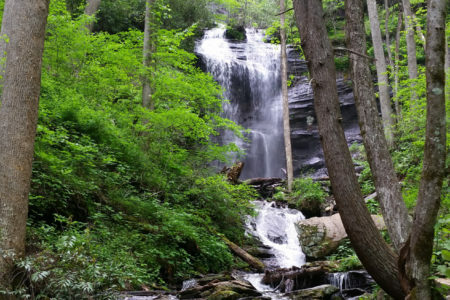 A highlights list wouldn’t be complete without experiencing the state’s waterfalls! 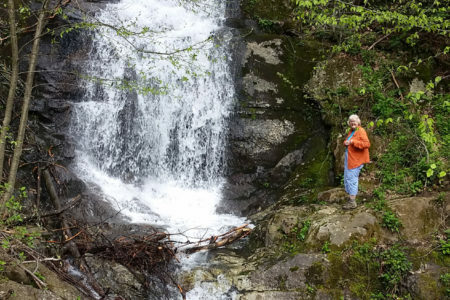 Naturally since this is a waterfalls website, we’ve got numerous write-ups that extensively cover these miracles of Nature.